About this Polypropylene 8 Solid Color Megaphone:Your advertising message will come across loud and clear with megaphones - 8" with curved bell.Printed with safe, durable UV ink.Meets child safety requirements for school giveaways.FDA Compliant – Safe for Food Contact. Child Safe.Material: Polypropylene - Recycle Code #5 - BPA-FreeSpecial Instructions:Rush Service:Rush Service prices are for one color imprint only, standard ink colors. Multicolor imprints, halftones, additional location imprints and PMS matches will require an additional 1-3 working days. About this 16 Foam 1 Hand / Mitt:16" - Foam cheering mitt in the shape of a number one hand.These colors may discoler when exposed to open air and light NOTE: Product comes with Prop 65 warning label when shipped to California. Label reads: "WARNING: This product may contain carcinogen, which is known to the State of California to cause cancer and Reproductive Harm. For more information, go to www.P65Warnings.ca.gov. About this 14 Foam 1 Hand / Mitt:14" foam #1 hand / mitt.These colors may discoler when exposed to open air and light Great For Sports Games Classic Foam Cheering Mitt Stock Printed 12 Available Colors Great For Sports Games These foam cheering mitts are great for pep rallies and sporting events for school and professional sports teams. Classic #1 Design Features the classic number one finger cheering mitt design with "#1 Fan" printed on the finger. Screen Printed These Number One Fan Cheering Mitts are screen printed with your logo or custom designed. Custom printed colors are available. Best Price Guarantee If you find these #1 Fan Cheering Mitts customized cheaper elsewhere, AnyPromo won't just match the price, we'll beat it. NOTE: Product comes with Prop 65 warning label when shipped to California. Label reads: "WARNING: This product may contain carcinogen, which is known to the State of California to cause cancer and Reproductive Harm. For more information, go to www.P65Warnings.ca.gov. About this Mega Hand Clapper:Give a hand and make some noise with this large hand clapper.Material: Plastic.Special Instructions:1 Day Rush, available upon request for 1 color, 1 imprint location orders. About this Shout - out Megaphone / Popcorn Holder:Plastic cone can be used as a megaphone, popcorn holder, or even a table centerpiece. Made in the U.S.A. Finish / Material: Polypropylene. About this Paper Megaphone, Full Color Digital:Cheer for your favorite team.Imprint also available on interior side of megaphone.Special Instructions:3 Day Rush: 1 location imprint. About this Fan - Ta - Stick Pair:Re-inflatable and re-usable vinyl fan-ta-sticks noisemakers make events come alive when the two sticks are banged together.This product is spot-printed. Each color printed will typically have up to 1/4" of drift. Designs with different colors too close together may result in the colors misregistering (overlapping with each other). About this 12.5 Cowboy Hat / Visor:Foam novelty 12.5" cowboy hat/visor. This 1-piece hat ships flat and is easily assembled to give you the Cowboy Hat look at a lower price.These colors may discoler when exposed to open air and light NOTE: Product comes with Prop 65 warning label when shipped to California. Label reads: "WARNING: This product may contain carcinogen, which is known to the State of California to cause cancer and Reproductive Harm. For more information, go to www.P65Warnings.ca.gov. About this Foam Trojan Hat:Trojan - Novelty mascot foam hat.These colors may discoler when exposed to open air and light NOTE: Product comes with Prop 65 warning label when shipped to California. Label reads: "WARNING: This product may contain carcinogen, which is known to the State of California to cause cancer and Reproductive Harm. For more information, go to www.P65Warnings.ca.gov. About this 18 Foam 1 Hand / Mitt:18" - Foam cheering mitt in the shape of a number one hand.These colors may discoler when exposed to open air and light NOTE: Product comes with Prop 65 warning label when shipped to California. Label reads: "WARNING: This product may contain carcinogen, which is known to the State of California to cause cancer and Reproductive Harm. For more information, go to www.P65Warnings.ca.gov. About this 8 Glow in the Dark Megaphone:Your advertising message will come across loud and clear with megaphones.Printed with safe, durable UV ink.FDA Compliant – Safe for Food Contact.Child Safe.Material: Polypropylene - Recycle Code #5 - BPA-Free.GLOW IN THE DARK PRODUCTS MUST BE EXPOSED TO LIGHT PRIOR TO USE.Special Instructions:Rush Service:Rush Service prices are for one color imprint only, standard ink colors. Multicolor imprints, halftones, additional location imprints and PMS matches will require an additional 1-3 working days. About this Rectangle Token Imprinted Pom 500 Streamers:Cheer on your favorite team with this fun rally accessory!Our shakers are an industry go-to for promotional fun!Great for schools, colleges, charities, and sports teams!Streamer counts 500 strands, approximately.Choose solid color or two color mixed streamers.Solid metallic poms not available.Color combinations available, Please Call for detail. About this Rally Pom - Pom - Two Tone:Cheer on your favorite team with the Rally Pom-Pom - Two Tone!Our shakers are an industry go-to for promotional fun!Great for schools, colleges, charities, and sports teams!Streamer counts 500 strands, approximately.Choose solid color or two color mixed streamers.Solid metallic poms not available. About this Contour Handle Imprinted Pom 500 Streamers:Cheer on your favorite team with this fun rally accessory!Our shakers are an industry go-to for promotional fun!Great for schools, colleges, charities, and sports teams!Streamer counts 500 strands, approximately.Choose solid color or two color mixed streamers.Color combinations available, Please Call for detail. About this Foam Dinosaur Hat:Dinosaur - Foam novelty animal shaped hat. Something for everyone! This foam animal hat is a great way to top off your promotion.These colors may discoler when exposed to open air and light NOTE: Product comes with Prop 65 warning label when shipped to California. Label reads: "WARNING: This product may contain carcinogen, which is known to the State of California to cause cancer and Reproductive Harm. For more information, go to www.P65Warnings.ca.gov. About this 15 Tomahawk:15" - Foam tomahawk shape waver.These colors may discoler when exposed to open air and light NOTE: Product comes with Prop 65 warning label when shipped to California. Label reads: "WARNING: This product may contain carcinogen, which is known to the State of California to cause cancer and Reproductive Harm. For more information, go to www.P65Warnings.ca.gov. About this Bull Horns:Bull Horns - Foam visor headwear.These colors may discoler when exposed to open air and light NOTE: Product comes with Prop 65 warning label when shipped to California. Label reads: "WARNING: This product may contain carcinogen, which is known to the State of California to cause cancer and Reproductive Harm. For more information, go to www.P65Warnings.ca.gov. About this 15 Reindeer Antlers:Foam 15" reindeer antlers visor.These colors may discoler when exposed to open air and light NOTE: Product comes with Prop 65 warning label when shipped to California. Label reads: "WARNING: This product may contain carcinogen, which is known to the State of California to cause cancer and Reproductive Harm. For more information, go to www.P65Warnings.ca.gov. About this Turkey Visor:Turkey - Foam visor headwear.These colors may discoler when exposed to open air and light NOTE: Product comes with Prop 65 warning label when shipped to California. Label reads: "WARNING: This product may contain carcinogen, which is known to the State of California to cause cancer and Reproductive Harm. For more information, go to www.P65Warnings.ca.gov. About this Split Ring Imprinted Pom - 500 Streamers:Cheer on your favorite team with this fun rally accessory!Our shakers are an industry go-to for promotional fun! Great for schools, colleges, charities, and sports teams!Color combinations available, Please Call for detail. About this 18 Foam Cowboy Hat:18" - Foam novelty cowboy hat.These colors may discoler when exposed to open air and light NOTE: Product comes with Prop 65 warning label when shipped to California. Label reads: "WARNING: This product may contain carcinogen, which is known to the State of California to cause cancer and Reproductive Harm. For more information, go to www.P65Warnings.ca.gov. About this 24 Foam Cowboy Hat:24" - Foam novelty cowboy hat.These colors may discoler when exposed to open air and light NOTE: Product comes with Prop 65 warning label when shipped to California. Label reads: "WARNING: This product may contain carcinogen, which is known to the State of California to cause cancer and Reproductive Harm. For more information, go to www.P65Warnings.ca.gov. About this Foam Football Helmet:Large foam novelty football helmet.These colors may discoler when exposed to open air and light NOTE: Product comes with Prop 65 warning label when shipped to California. Label reads: "WARNING: This product may contain carcinogen, which is known to the State of California to cause cancer and Reproductive Harm. For more information, go to www.P65Warnings.ca.gov. About this Foam St. PatrickS Day Top Hat:Foam novelty Irish top hat.These colors may discoler when exposed to open air and light NOTE: Product comes with Prop 65 warning label when shipped to California. Label reads: "WARNING: This product may contain carcinogen, which is known to the State of California to cause cancer and Reproductive Harm. For more information, go to www.P65Warnings.ca.gov. About this Football Helmet:Blitzhead - Foam football helmet in stock graphic designs. NOTE: Product comes with Prop 65 warning label when shipped to California. Label reads: "WARNING: This product may contain carcinogen, which is known to the State of California to cause cancer and Reproductive Harm. For more information, go to www.P65Warnings.ca.gov. About this 12.5 Paw Print Mitt W / Outlined Pads:Foam paw print cheering mitt with outlined pads.These colors may discoler when exposed to open air and light NOTE: Product comes with Prop 65 warning label when shipped to California. Label reads: "WARNING: This product may contain carcinogen, which is known to the State of California to cause cancer and Reproductive Harm. For more information, go to www.P65Warnings.ca.gov. About this Turkey (2- Pc) Pop - Up Visor:2-pc.turkey top - Novelty foam 2-piece pop-up visor. Make your next promotion really "POP" so you can stay ahead of your competition. All 2 piece pop-up visors are shipped unassembled.These colors may discoler when exposed to open air and light NOTE: Product comes with Prop 65 warning label when shipped to California. Label reads: "WARNING: This product may contain carcinogen, which is known to the State of California to cause cancer and Reproductive Harm. For more information, go to www.P65Warnings.ca.gov. Thank you Meg, Justin and Jasmine! We’re glad to read your positive reviews on our 14” Foam #1 Hand / Mitt! We know this is a popular product when it comes to sporting events. The 14” Foam #1 Hand / Mitt is great to sell to sports fans, or also giveaway to your team’s fandom. The foam fingers are fun for sporting events, company competitions, church groups, and more! Available in red, blue, green, orange, navy, maroon, purple, yellow, charcoal, teal, white, and pink. Thank you Catalina, Cynthia and Alisa! 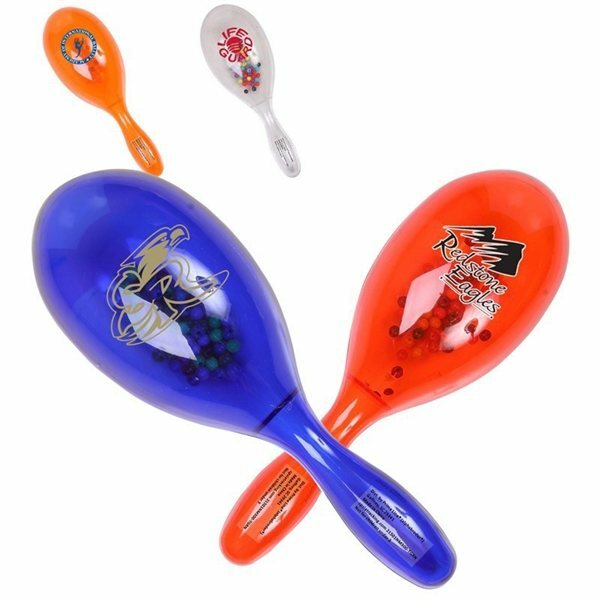 The Plastic Translucent Maracas Filled With Plastic Beads is a fun item to make noise with. Rattle up the crowd with our Plastic Translucent Maracas Filled With Plastic Beads. It’s great to distract any opponent going up against your team. Back your team up with this great promotional cheering and spirit item. Plastic maracas filled with plastic beans. Available in translucent green, translucent blue, translucent red, translucent yellow, translucent orange, and clear. Thank you Marsha and Lindsey! We love reading positive reviews about our promotional products. The Fan-Ta-Stick Pair is a fun item to make noise with. Customers will love to represent their true team spirit with this promotional item. Available in pink, black, red, white, blue, green, orange, yellow, silver, burgundy, purple, and gold. With over 500 promotional cheering and spirit items available, you’ll find the most spirited item to complement your company. We have maracas, megaphones, clap noise makers, popcorn holders, hats, horns, sticks, poms, visors, foam hands, and more! Cheering & spirit items are great for representing a team or school! Cheer your favorite team on with our promotional cheering and spirit items. You’ll have fun with our promotional items available. Cheering and spirit can add so much more to your customer’s experience. Give them the fan filled experience they want for your company, team, or school! Look through our selection of cheering & spirit. Shop here! Just like our customers, AnyPromo sets the bar high when it comes to making a big brand impact while getting the best bang for your buck. Search our cheering and spirit inventory to find what best fits your promotional goals. Cheering and spirit promotional items are great for local teams, school spirit, or company picnics! If your company, school, or team likes to represent, then promotional cheering and spirit is for you! Cheering and spirit is great for everyone fan out there! We have fun items that customers will love to have while cheering on their company logo! Below you’ll find a list of some of our trending promotional cheering and spirit. Every item is available and waiting for you to order. Promotional cheering and spirit items are great for all sporting events! Give your team’s fan-base the items they need to cheer on your team! Promotional cheering and spirit items are great for any competitive event. Represent your company logo on a promotional item today! Our featured list of cheering and spirit includes what’s currently trending! When it comes to cheering and spirit in our selection, you’ll definitely find the perfect product to represent your company or team.